In a PDF document, you can extract characters from the document and then save the characters as Word document with the help of the application VeryPDF PDF to Word Converter which is specially designed for converting PDF document to Word file. At the same time, this application also supports to set different parameters for created Word document. If you want to extract characters from PDF to Word document, please download the application VeryPDF PDF to Word Converter at first via clicking the following button. Please double click the application installer and then install the application on your computer via following the setup wizard. If necessary, you can create a desktop icon for the application so that you can launch the application anytime. Then please open the application and you will see its user interface. When you are ready to add PDF document into the application, you can use drag and drop operations to directly “drop” PDF document into the application. Or you can click File—Open to open file picker window from which you are able to add PDF document. 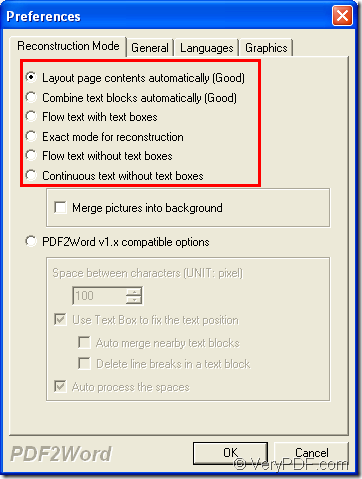 After adding PDF document, the Preference window for setting parameters for target file will come out. 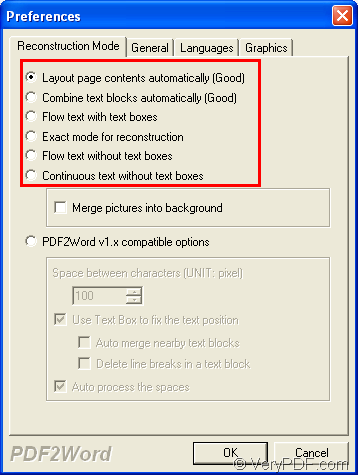 In Reconstruction Mode tab, you can choose a suitable reconstruction mode for created Word document. For example, you can combine text blocks automatically, flow text without text boxes, etc. Please see it in next snapshot. For getting a well composed Word document, you can choose any one of the reconstruction mode according to your needs. Then please click OK button to save the changes and then close the current window. Then you will be able to see the window for saving target file. In Save as window, you can choose output location and edit the file name for created Word document. After clicking Save button, the conversion from PDF document to Word file will run. Please wait for several seconds until you get the target Word document in the specified location of your computer. If you have any questions about this conversion or this application, you can leave your words here to raise up your problems. If you are interested in VeryPDF PDF to Word Converter, welcome enter the homepage of it to learn more information about it.